Warequip’s new Jumbo Two vehicle. 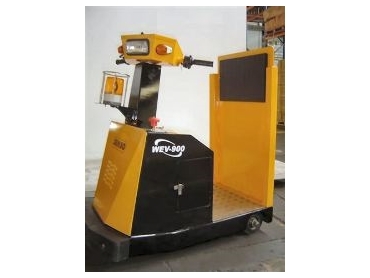 WAREQUIP, represented in Australia by Warehousing Equipment , has released the new three wheel Jumbo Two vehicle (WEV900). It is a small compact, stand up tow motor, ideal for narrow aisle environments. Jumbo's versatile design is suitable for transportation needs in hospitals, nursing homes, universities, airports and warehouse applications. The WEV900 is pollution free, operates silently and is highly manoeuvrable, with a generous 1200kg towing capacity. Its integrated design and overall length of 1325mm provides a unique versatile turning radius of only 1230mm. This coupled with its top speed of 8km/h, makes the Jumbo both compact and efficient for daily operations in many environments. The Jumbo is standard with full safety features, flashing light, indicators, horn and hitching pin. Operator ergonomics are a feature of this unit, with low step on and off chassis, hand throttle control and clear view stand up operation.